THIS ITEM IS NOT AVAILABLE AT PRESENT. WE WILL NOT BE GETTING ANYMORE DC Comics Harley Quinn Holiday Red Black and White Statue. From the Batman collection by DC Collectibles. 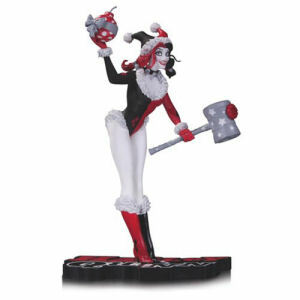 DC Comics Harley Quinn Holiday Red Black and White Statue. Harley is holding a gift wrapped bomb and hammer. Statue measures 7 inches tall.